Asa was home from Washington, licking her wounds. Her trial by fire was over, and the lawyers had been paid due to the fact that I had remortgaged the Butterfly. Brannon and I were in debt again. Big debt. I was hoping he would be home early so we could discuss how to negotiate our way back to financial solvency. I had gone to the bank today to cash a check and discovered that thousands were missing from our household account. Brannon needed to tell me where he had mislaid his paychecks so I could put them in the bank. Brannon was getting so absent-minded lately. He rarely spoke anymore and seemed to be brooding about something. I was wondering if his architectural firm was having trouble. “I hear Dad’s car,” said Asa, setting the Nakashima table. “What’s up with that?” asked Asa, fearful her troubles were causing a breach between her father and herself. He didn’t even seem to care about what she had been through the past year. He never spoke of it nor gave her any encouragement. She wondered if he blamed her for the controversy. “Well, something’s going on,” she concurred. Before she could continue, Brannon came in through the front door and popped his head into the kitchen. “No problem.” I put the food on the table. After washing our hands, Asa and I took our places at my beloved Nakashima table where we waited and waited and waited. Asa started to rise when I motioned for her to sit back down. Concerned, I folded my napkin and went into the bedroom. The bathroom door was shut. If I had been smart, I would have looked around the room but I didn’t. I just went back to the dining room. “He says to go ahead,” I relayed to Asa. Asa picked up a roll while I spooned some veggies and a big slice of roast beef onto Brannon’s plate. I then filled her plate and mine. Brannon strolled in and took his place at the table. “How was work today, Dad?” asked Asa. I gave Brannon a big smile. We chitchatted about little things. I told him that I had seen the Pileated woodpeckers today, a rare sight in Central Kentucky, and that I had decided to teach a summer course. Stunned, I answered, “Of course. I was just asking. I didn’t mean to come off that way.” I gave Asa a curious look. Brannon spent the rest of dinner eating in silence while Asa and I spoke about her looking for a job. She even spoke of starting her own company. Our tense dinner was quickly finished, followed by Asa clearing away the table while I fetched a brandy for Brannon. Grunting a thank you, he took the brandy but just placed it on the table while staring out the patio window. Brannon nervously tapped his brandy glass with his other hand. “Brannon?” We stared at each other until Asa broke the silence. “Mom. I think he’s trying to tell you that he is leaving us.” Her face had whitened into a pale mask as she peered out from the kitchen into the dining room. “You hate your life here?” I echoed, my voice becoming shrill. I couldn’t breathe. It felt like someone had just pushed me off a cliff. “This has caught me totally off guard. I don’t understand. How can you leave when the farm is saddled with debt and after what Asa’s been through the last year? How can you leave us with all this going on?” I was bewildered. “Now Asa, don’t start,” Brannon begged. Asa and I glanced at each other. “Is there someone else?” I asked, fearful of the answer. “Calms down? You’ve got to be kidding. Is there anything I can say or do that will make you talk this out?” I pleaded, reaching for him. I literally wrung my hands not knowing what to do. Should I let him walk out the door? Should I beg him not to leave? Was he having a mental breakdown? What was the right thing to do? My hand dipped toward my chest as I listened to my ragged heartbeat. I heard him go into our bedroom, get something and then leave by the bedroom patio door. “Oh my God,” I whimpered, shutting my eyes. I rushed into the bedroom and looked where Asa was pointing. I fell against the closet door in disbelief. Brannon had rummaged through my things and taken all my expensive jewelry, a coin collection I was saving for Asa and several couture dresses. My things were strewn all over the floor. I numbly pulled a file from my desk drawer in my office, which gave her the code words. Within a half an hour, Asa came back with printed pages of all our savings funds. Brannon had taken money from each one of the accounts. There was almost nothing left. The only thing intact was my retirement fund, which he could not touch. “What? I don’t know about that. Locking your father out of his own house?” What Brannon had done still hadn’t registered. I heard Asa in the next room making several calls. Then she brought me a stiff bourbon. I drank it and then another. I wanted to get stinking drunk. Several years later . . . The dark-clad figure pulled out the wires to the security box. Deftly, the intruder cut the correct wire to silence the alarm. Then going around to the southwest part of the huge mansion built in 1832, the thief skillfully unlocked the side porch door and stepped into the library. Hearing a dog growling in the hallway, the thief threw a piece of meat toward the hall and stood patiently until the dog ate the meat and a moment later groggily stumbled, falling asleep. It would sleep for several hours from the drug administered to the meat, but would wake up unharmed. The thief looked for a wall safe behind paintings and even tapped on the walnut paneling. Finding nothing, the dark figure concentrated on the desk, taking pictures of any checks, bank statements, investments that could be found. Then the thief copied the computer files onto a flash drive. Several drawers were locked, but it took the thief only seconds to break them open. Finding a handgun, the thief put it into a black bag, also several silver trophies from a bookshelf. Silently investigating the house, the thief went to the front parlor. There the thief moved to the Duveneck painting hanging over the mantel. With quiet efficiency, the thief broke the frame and cut the painting from its stretcher. Rolled, the painting was placed in a tube the thief had brought. Both the painting and the bag with the silver were lowered out a window. Now unencumbered, the thief studied the massive staircase. Making a calculated decision, the thief leaped up the stairs, taking three steps at a time. Hiding in the shadows of the hallway, the thief saw that most of the upstairs doors were open. Seeing what looked like a nightlight dimly peeping into the hallway, the thief surmised that it came from a child’s room and headed for it. A boy, wearing Spider-Man pajamas, lay asleep in a bed designed to look like a racecar. The thief studied the child’s features. Suddenly the thief’s hand shot out, but only to pull the blanket over the little boy. The sleek, black figure pulled away and went to look for the mother’s room. Going next door, the thief discovered the mother of the boy asleep in her king size bed. She was wearing shorts and a sports bra. Like the boy, she had thrown off her blanket and lay sprawled across the bed, lightly snoring. A purse hung off a chair. The thief claimed it and then went directly to a jewelry box sitting on the vanity, and took it downstairs. Pouring the contents of both the purse and the box onto the couch, the thief picked up several pieces of jewelry and a wallet, then fled out the side door. The thief was careful to lock it again. Picking up the bag and tube, the thief absconded into the woods and to a country road where a black sedan was waiting. Flinging the goods in the trunk, the thief turned off the night goggles, throwing them on top of the sack. Starting with gloves, the thief took off the dark jumpsuit, revealing a casual fall outfit. The dark clothing was stuffed into a garbage bag and securely tied. The thief let long dark hair escape from a confining cap and got in the car, quietly shutting the door. The car sped down Old Frankfort Pike with its lights off until it cut over the road to Midway. Asa leaned back in the seat, smiling to herself. Ellen was going to be distracted as she was going to spend a great deal of time cleaning up the identity theft which was going to start occurring tonight. As for the jewelry and silver, Asa would stash it in her New York apartment’s safe until she could have something made from the stolen loot. The credit cards would be given to her driver. Forty-five minutes later, Asa boarded a Piper from a private airstrip in Scott County and flew to New York. The employee made several outlandish purchases from Ellen’s laptop with her credit cards and later dropped the cards on the floor of a disreputable drinking establishment in Covington. 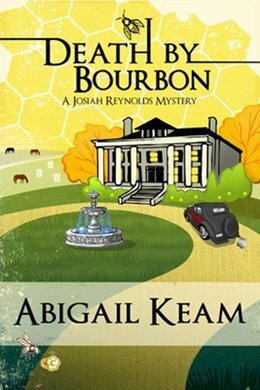 Josiah Reynolds slept fitfully in her bed, never knowing that her daughter had been in Kentucky. Josiah also didn’t know a confrontation was happening that night between two women, which would lead to their mutual destruction.